The Johnny Cash 84th Birthday Bash will take place over two nights at The Hall at MP Brooklyn, Friday, February 26, 2016 and Saturday, February 27, 2016. On both nights, the 7-piece outfit known as Alex Battles & the Whisky Rebellion will play a full evening’s worth of Johnny Cash hits and rarities. 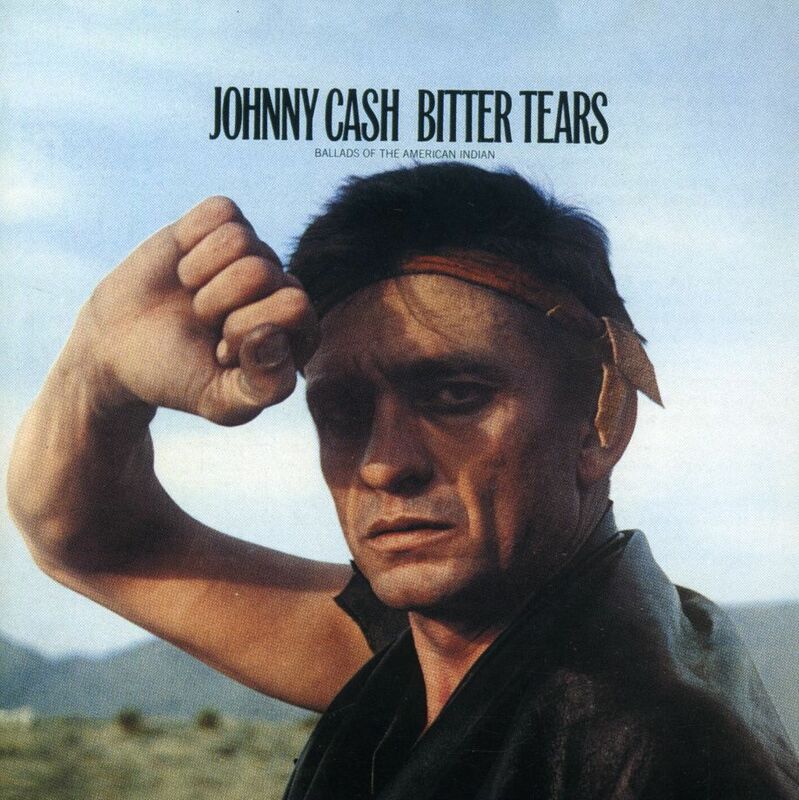 In addition to Johnny’s chart topping singles, Friday night‘s setlist will include songs from the 1970 album “Hello, I’m Johnny Cash“, while Saturday night‘s performance will focus on songs from “Bitter Tears: Ballads of the American Indian” over the course of the evening. The Dock Oscar Gospel Quartet will provide backing vocals throughout the weekend. Dock Oscar is the creator of the seminal showcase, The Kings County Opry which coalesced the Brooklyn country music scene every month from 2003-2007. He is also an excellent singer/songwriter and leader of the band Sweet William. Alex Battles began writing and performing his songs onstage in 1999. Battles formed his band, The Whisky Rebellion in 2001, started the CasHank Hootenanny Jamboree in 2004 and began producing the annual Johnny Cash Birthday Bash in 2005. Battles also founded the Brooklyn Country Music Festival, which saw ten installments capped by 2015’s performance headlined by Brooklyn native Ramblin’ Jack Elliott. Among the fantastic folks Alex Battles has opened for are Junior Brown, Dan Bern, Joe Doe, and Teddy Thompson. In 2011, Battles released Goodbye Almira, an acoustic album of his own compositions featuring Aoife O’Donovan on guest vocals. He is currently producing Jan Bell & The Maybelles upcoming LP, set for release in fall 2016. Johnny Cash was born on February 26, 1932 in Kingsland, Arkansas. As a boy, he sang in church. 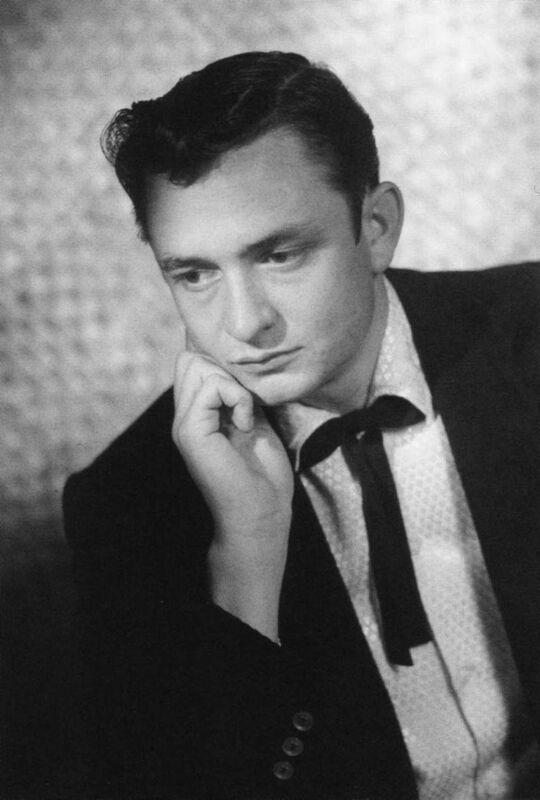 After completing a four year stint in the Air Force, Cash moved to Memphis in 1954 to find work and pursue a career in singing. Through his brother, he met his band, Luther Perkins and Marshall Grant, with whom he would create his one-of-a-kind sound. Working with Sam Phillips at Sun Records, Cash turned into one of the label’s brightest stars, able to write his own songs as well as sing the songs of others. A move to Columbia records allowed Cash the freedom to make concept albums focused on specific topics that garnered his attention. On a trip to New York City in 1965, Johnny Cash heard a performance of singer/songwriter Peter LaFarge’s songs detailing the injustices suffered by Native Americans at the hands of European settlers. While LaFarge’s “As Long As The Grass Shall Grow” had previously been performed by Bob Dylan, Cash took things a step further. Adding three of his own compositions, Cash recorded five LaFarge compositions including the single “The Ballad of Ira Hayes” to create the landmark album “Bitter Tears: Ballads of the American Indian.” Initially rejected by country radio, Cash hired independent promoters and personally lobbied disk jockeys to play the record. For his efforts, Cash was adopted by the Turtle Clan of the Seneca Nation and given the name “Story Teller”. 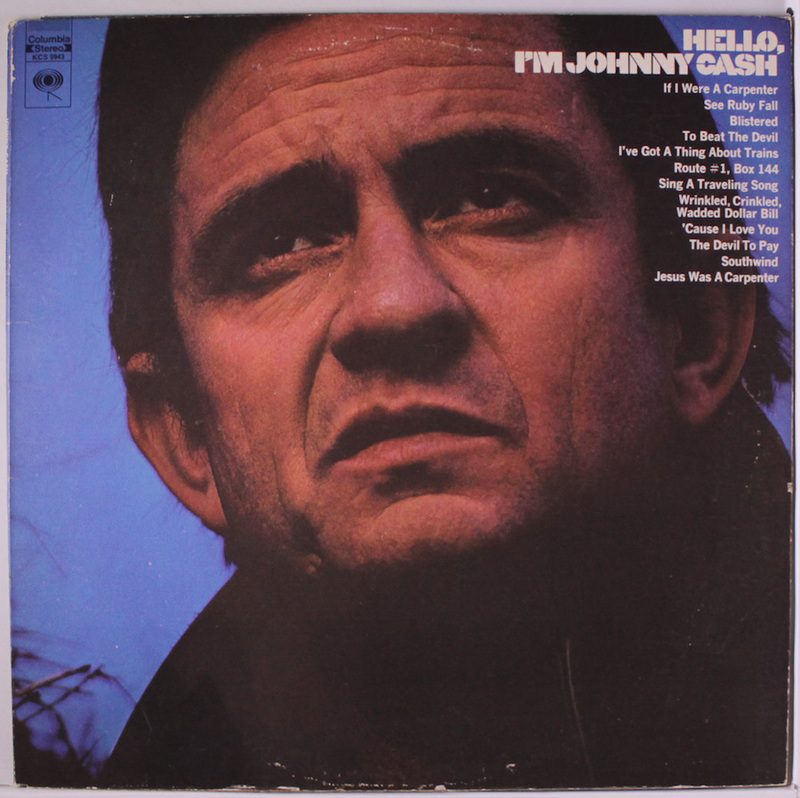 After the landmark live records “At Folsom Prison” and “At San Quentin”, Cash returned to the studio to record “Hello, I’m Johnny Cash,” a personal record which includes “To Beat The Devil” (Cash’s first cover of a Kris Kristofferson song), “Blistered” (duet with the Carter Family), “Sing a Traveling Song” (written by Helen Carter’s son, Kenny Jones), “See Ruby Fall” (co-written by Cash and Roy Orbison), and “Box 1, Route 144” a sobering reminder of the harsh reality of war. The Whisky Rebellion boasts Sammo on guitar, Shaky Dave on harmonica, Tina Lama on bass, “Smilin'” Charlie Shaw on drums, and Kari on fiddle. Joining the fray onstage will be writer/performer Miss Linda Hill who has performed with Minnie Pearl, Robin Williams, and George Carlin. She performs regularly in New York City with her band, The Lucky Fellers. Backing the band on vocals will be the Dock Oscar Gospel Quartet. Dock Oscar is one of the founders of the Brooklyn Country Music Festival and the creator of the Kings County Opry, which ran monthly at Freddy’s Bar for ten years. The Hall at MP is a truly unique hospitality driven music and event space by chef Michael Psilakis. Located in the heart of Williamsburg Brooklyn at 470 Driggs, The Hall is an acoustically treated and engineered space that is outfitted with a state of the art sound system by Martin Audio. 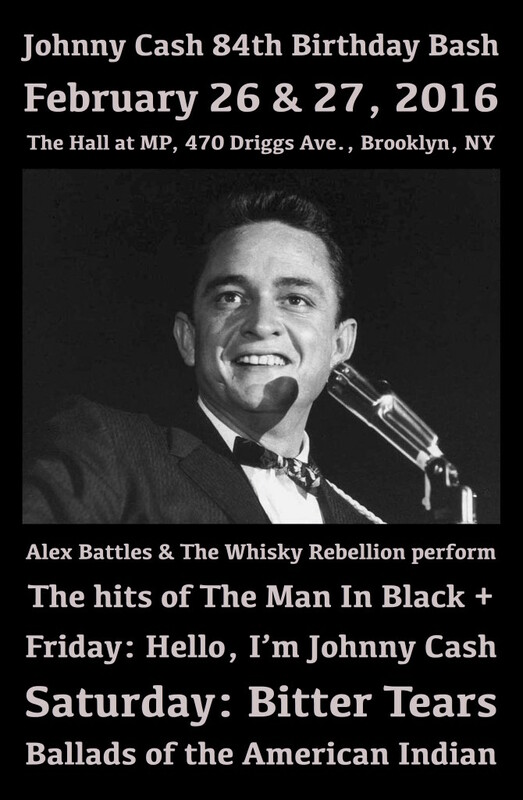 Tickets to the February 26, 2016 and February 27, 2016 performances of the Johnny Cash 84th Birthday Bash starring Alex Battles & The Whisky Rebellion at the Hall at MP Brooklyn are on sale now. Advance tickets to this event are strongly recommended.